QR Inventory is simple to use, yet powerful mobile inventory and asset tracking solution with just the right set of features to get the job done. With QR Inventory you will have no problems maintaining accurate inventory count and assets locations, regardless of how dispersed you assets and inventory are. Your employees will use their own or company's mobile devices (smartphones or tablets running iOS or Android) to process assets and inventory transactions on site as they happen. No delays or miscommunications in reporting inventory updates. Inventory and assets transactions are submitted to a centralized cloud location and are available to all authorized employees in real time. Field employees access up to the minute information on their mobile devices, and office employees via the web dashboard. Use smartphones for QR code / barcode scanning, and avoid mistakes connected to the manual data entry. Your scanner is always in your pocket, no need to carry around bulky inventory management hardware. You will also save a lot of money, since barcode scanning equipment is quite expensive. 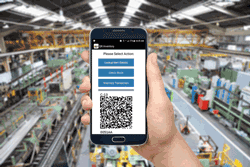 For the situations when you need faster and more robust scanning than smartphone camera can provide, QR Inventory Pro mobile application is natively integrated with bluetooth barcode scanners. Record additional information for inventory transactions, such as what job, project or client inventory was used for. Take photos and attach to inventory transactions for visual documentation. Collect customer or supervisor signature. Automatically capture GPS location where asset or inventory transaction was performed. Create pdf of the transaction receipt and e-mail to multiple addresses from a smartphone. And you won't need to spend an extra dime on the hardware - all these can be done using regular smartphones / tablets and QR Inventory mobile application. Your employees can access all information needed to perform their job on the spot. Wherever they are: in the field, on the shop floor, at a customer location, on the job site - they will have an access to the up to the minute data on the asset or inventory. All they need to do is scan QR code / barcode label with a smartphone. You decide what information should be available to the employees: asset specifications, pdf documents, images, drawings, operation instruction, and anything else you need. Easily adjust QR Inventory software to your business. Define what do you want to track, record and report via easy to use web interface. Create custom fields to hold all required information on the assets and inventory, including images and pdf documents. Create custom transaction types for your business model. Define what additional data to collect for assets and inventory transactions. Create custom mobile forms for data collection. Create custom processes and workflows. Create custom template(s) for pdf reports. Track inventory by SKU, lot number / batch number or serial number. QR Inventory is very intuitive, easy to learn and use. It has a minimal learning curve, so you can become productive fast. The easiest thing to learn is what you already know. Your employees already own and are using smartphones and tablets every day, so they can start using QR Inventory right away, without spending extra time on learning and training. Initial asset tagging, inventory labeling and data entry can be a long and painful process. Not with QR Inventory! QR Inventory software has multiple options to get your assets and inventory into the system in no time. Already have a list of assets, inventory, stock and locations? Bulk import it into QR Inventory. Need to start from the scratch? Use a smartphone and QR code / barcode scanning to do initial asset / inventory entry, locations and count on site. Need new labels? QR Inventory has built-in tool for generating, downloading, laying out and printing QR code labels, or you can use our pre-printed weather-proof labels. Assets or inventory items already labeled with manufacturer's barcode? You can use existing UPC barcodes as well - no need to re-label. Link asset and inventory management to the business processes. Track assets life cycle, from assignment and ownership to maintenance and repairs. Report asset conditions and damage from the field. Manage business operations and processes, track items or product batches through the process from start to finish. Collect data on site using mobile forms. Achieve products traceability. Collect any kind of data on your assets using mobile forms. Create custom mobile forms via the web dashboard, and your employees will have them on their smartphones for data collection. Record assets service, maintenance and repairs. Report assets conditions, identify damages, request service. Create checklists for assets procedures and routine inspections. Record actions performed on the assets, e.g. calibration. QR Inventory allows you to create custom workflow and processes, and track items through the process from start to finish. Use smartphones or tablets for barcode scanning and data collection / recording. Collect any data you need for each step: equipment used, ingredients added, actions that were performed, etc., etc. Attach mobile forms to the process steps, and employees will be able to fill them out while performing the job. Get real time inside into the ongoing processes and progress, and restore detailed history of each item or product batch: how it was moved through the process steps, dates, employees performing the job, collected information and filled out forms. Use multiple search filters to quickly find required information. With QR Inventory, in case of a problem you can quickly find affected products, where they were distributed, what components / ingredients were used in their production and where in the process the problem could have happened. The tracking starts with assigning lot number or serial number to raw materials, components and ingredients. You can record any data on the product batch: date produced, manufacturer, storage conditions, PO, etc., etc. While assembling a final product, track what batches of materials are used, as well as steps of the production process. For the finished products, record where each batch / serialized items were distributed and any associated details, from tracking numbers to warranty expiration. Should the problem be reported, you can quickly find all information needed for the recall and problem investigation, from used components to details of the production process to product distribution. All information collected in the field or on the shop floor with the smartphones, from inventory transactions to process tracking and filled out forms, is stored in a secure cloud. You do not need to have paper forms, notes or separate excel spreadsheets any more. All assets and inventory related information is well organized, easily searchable and never misplaced or lost. Centralized cloud based storage allows all employees to access information they need in real time. If you need to produce documentation for the external sources (customers, controllers, etc. ), QR Inventory will make this process effortless. You can create a custom template to define format of each report type, than create pdf reports with a click of a button. Pdf reports can include data collected in the field, signature, image(s) and item information. Your field employees can create a report on a smartphone, after they completed a form and collected a signature. They can view report, print and e-mail to the selected addresses. Administrators can review / download pdf reports via the web dashboard, or create a new report. Build an application to fit your business requirements by adding the right set of modules to extend QR Inventory functionality. Need to track production process, collect data and fill out mobile forms? Add mobile data collection module. Assemblies & kits module will allow you to track building of multi-level assemblies. Stock taking / audit module streamlines physical inventory count and assets audits. If you are not using stand-alone accounting software, QR Inventory accounting module will help you auto-create and keep track of purchase orders and invoices. Electronic signature and document module will allow you to collect electronic signatures using a smartphone, create customizable pdf documents and reports. More modules are available - select just the right combination to fit your business process. Even though QR Inventory software covers a lot of bases and is far ahead of the competition, we do realize that every business is unique. We are ready to work with you to customize QR Inventory, should you need any modifications to fit your specific situation and needs. This can also include integration with your ERP / accounting system. QR Inventory is an online hosted solution, but if you prefer to host QR Inventory on your network - no problems. Of course, you can also host on our servers specifically designed for this type of applications and serviced by qualified personnel - the choice is yours. We are listening to your feedback, and are adding new features to QR Inventory on a regular basis. With our cloud hosting you get all upgrades automatically as they become available.